Smart App Generator is new online service which allows you to build android app from any RSS feed for free. It is useful for many bloggers and website owners who wants to build android app for there blog. Many bloggers doesn’t have any experience about android but still wants android app for there blog. Having android app for blog will increase visitors to there site and bring more revenue to the blogger. 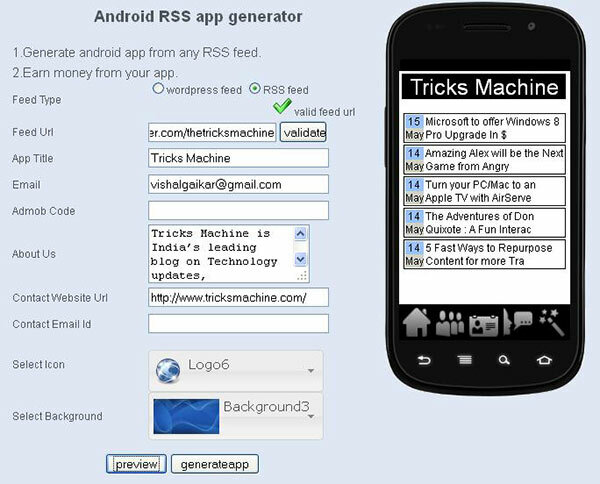 Generate android app from the RSS feed. It has extra features for WordPress based sites. Generate revenue from the app generated. Notification to the users when new post is published. It takes less then 3 minutes to build app. No coding is required to build android app. The service – Smart App Generator is completely free and also user can earn money from there blog. The app generation is instant and can be downloaded . They have also widget which can be embedded to any website or blog. The bloggers/ website owners can give the blog generation service to its readers by embedding widget in the site. So guys, create an android app for your blog using your blog RSS feed with Smart App Generator and let us know what do you think about this via comments below.